In response to requests from residents, the Rockland County Solid Waste Management Authority has partnered with the Rockland County Sheriff’s Dept. to give residents more opportunities to drop off their unused or expired controlled and non-controlled substance medication for safe, proper disposal than ever before. The Solid Waste Authority and the Sheriff’s Dept. 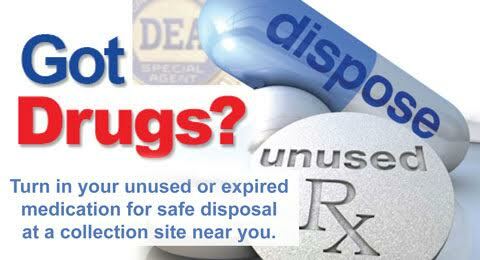 have partnered to schedule 10 “Medication Take Back” events in Rockland County this year. The fourth of the 10 “Take Back” events is taking place 8 a.m. – 1 p.m. this Sunday, June 4 at the Solid Waste Authority’s Household Hazardous Waste Facility, located at 35 Fireman’s Memorial Drive in Pomona. The take back service is completely free, anonymous and medication does not need to be labeled to be accepted. Officials urge residents to take advantage of the opportunity to dispose of medication properly. It not only keeps your medicine cabinet up to date, it also protects the environment. Solid Waste Authority officials note that meds thrown in the trash can spend years degrading into the soil and eventually make their way into ground and surface water. In addition to the effect on water, chemicals from medicinal waste can also end up in fertilizers used on the soil. “When you flush or throw away medication it can contaminate the environment and ultimately our water. However, when you properly dispose of the medication through our take back event those harmful pharmaceuticals will not enter the water supply,” Anna Roppolo, executive director of RCSWA, said. The medication collected is disposed of through incineration. The incineration process has proven to be the most effective way of disposing of medication, Roppolo said. Leaving unused medication around the house can also lead to controlled substances ending up in the wrong hands. As the scourge of prescription drug abuse continues to make headlines across the United States, it is a good time to consider cleaning out your medicine cabinet for this reason, as well. Rockland residents have the alternative of disposing of their unwanted medication 24/7 at the Rockland County Sheriff’s office or their local police department. Currently the local police departments who participate in the take back program include the Clarkstown, Orangeburg, Stony Point, Piermont, Nyack, Spring Valley and Suffern. As a reminder, SHARPS (needles) are not accepted at the HHW Facility or as part of law enforcement programs. Residents are strongly urged to utilize the alternatives available to ensure proper disposal and deter medication from being used by others than intended. Residents can call 845-364-2175 or visit https://rocklandgov.com/departments/health/health-dept.-calendar/sharps-collection3/ for more information on SHARPS disposal. The Authority will continue to educate residents about pharmaceutical disposal in Rockland County at upcoming events, including paper shredding events at each of the five towns. As a reminder the next paper shredding event will take place on Saturday, June 3, at Stony Point, Patriot Hills Lane from 8 a.m. – 12 noon. A complete list of all paper shredding events and week end collection events is listed in the 2017 Household Hazardous Waste brochure mailed to each household.